Imagine a beautiful farm which is peaceful and serene, which makes your mind clear and get rid from the busy schedules of your life. Fresh air, fresh vegetables, sizzling atmosphere....You will be longing to be here as soon as possible. This is what a 'Farm Tourism' will offer you. Simply talking, 'Farm Tourism' is something, which promotes tourism through agricultural activity. Tourism always accused to have a bad effect on our environment, natural resources etc.Introducing 'Farm Tourism' is a new way to tackle this. Along with promoting tourism, 'Farm Tourism' also helps to maintain the balance of the nature by giving importance to the natural resources. One of the growing sectors in Tourism, Farm Tourism can be considered to be one among the five types of rural tourism. The other types are eco­tourism, adventure, cultural and activity tourism. Farm tourism is also known as agro­tourism or agri­tourism. Any agriculture based activity, which attracts tourists can be termed as farm tourism. Those who are visiting the farm will be getting an opportunity to spend their valuable moments here. What makes a farm stay different is nothing but the serene ambience here. A healthy walk through the farm itself is a way to rejuvenate yourself. Everything will be natural here. You will not have to set alarm clocks to wake up in the morning, the nature itself will help you to get out of your sleep. A farm stay is also a treat for your taste buds. Along with mouth watering recipes, you will also be able to follow a healthy diet at these farm houses. These farm houses is also a best spot for shopping natural products. Some among them also provides organic seeds to explore the farmer in you. Getting closer to nature is a way to be away from majority of the lifestyle diseases. Experience this directly with the help of farm tourism. 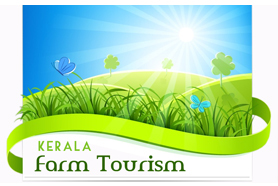 An agricultural based society, Kerala has endless opportunity to develop farm tourism. Tourist who visits Kerala, always want to experience the greenery here. If they are given an opportunity to explore the nature, they will definitely utilize it. Much additional investment is also not needed for promoting so called 'farm tourism'. As per reports, Kerala has around 3,50,000 lakh hectares of land under paddy cultivation. This can ideally be converted into tourism hot spots without disturbing the farm activities. Now the state tourism department recently has launched 'Green Farms Kerala', which aims to revamp agricultural land in the state to tourism destinations. Along with promoting tourism, this scheme will help the locals especially the farmers too to have financial stability. Farm tourism helps the tourists to be part of day – to – day agricultural activity. They can also buy products from there along with enjoying the local cuisines. The additional income from this can be utilized for the improvement of agriculture and farming. © Copyright 2015 Kerala Farm Tourism. All rights reserved.